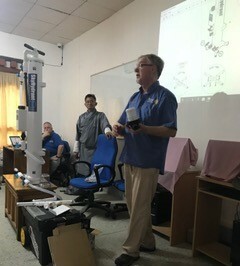 As part of the Disaster Aid Australia (DAA) Safe Water Bhutan 2020 project a DAA team carried out training in Tsirang, Bhutan. Who are Disaster Aid Australia. The DAA training team consisted of Brian Ashworth Director, and Disaster Aid Response Team (DARTs) members Dianne Holland, and Peter Collins. Assistance with translations by Department of Education Officials, and Sonam Tshering of Druk Water Solution, was an important factor in getting the messages across. The DAA team, and our partner the Rotary Club of Thimpu, were delighted with the interest of the participants which was demonstrated by their many thoughtful questions and discussions between sessions. The first day of training was for a total of 75 students ranging from senior engineers to school caretakers. Following the initial day, two days of ‘hands on’ training was carried out for the installation teams so they could get a better understanding of the practical problems of installations. Having trained effective installation teams funded by the Bhutan Government will ensure the Safe Water Bhutan 2020 project is carried out as effectively as possible. Disaster Aid Australia’s main reason for installing SkyHydrants is to protect the health of children like this young boy in the Camarines Sur Region of the Philippines. It is not the only advantage this technology has. . . . The overall cost of water from a Skyhydrant is less than 1 cent per litre over the life of the system. This compares with 50 cents per litre for a small bottle of water bought locally. Even buying a 5 litre bottle of water, the cost is around 40 cents per litre. This doesn’t seem much to Australians, but in the Philippines the minimum daily wage is around $7. If a family buys a 5 litre drinking water from the supermarket that may be almost a third of someones wage. Low cost safe water means that more money is available for food, clothes and other necessities. When Disaster Aid Australia (DAA) delivers a SkyHydrant we believe that the recipient should have the opportunity to be a full partner in the installation. In the case of a recent installation in the Camirines Sur region of the Philippines DAA provided the SkyHydrant, pipes, plumbing fittings and storage tanks. The San Ramon Pilot National High School community, including the parents, agreed to construct a secure building to house the skyhydrant and support the storage tanks. Although some guidance was provided by DAA volunteers the final details were approved by the school community. A sturdy rendered concrete block building. The header tank mounted on the reinforced concrete roof. A concrete platform for the filtered water tanks. Galvanised steel roofs to protect the tanks. A steel gate so the installation is secure. As well as meeting the cost of the materials much of the labour was provided by the parents of the pupils. With a partnership like this the SkyHydrant installation becomes more than a donation as the local community now have developed a personal pride in the installation. One of the advantages of the SkyHydrant we use for ‘Safe Water for Every Child’ and ‘Smart Aid’ is that the units weigh less than 20Kg. This means that when our volunteers are flying out for an installation they can take at least one SkyHydrant as checked baggage, when they restrict their personal gear to a carry on bag. High status frequent flyers can often take 2 units. This saves Disaster Aid Australia money which can then be spent on more aid. In a disaster response it also saves time getting safe water to where it is needed. Recently staff from one of our supporters, Calmar Corps, were visiting the Philipines and offered to take 2 SkyHydrants with them to be delivered to Cagayan de Oro on the island of Mindanao. The two SkyHydrants travelled from Melbourne to Sydney and then Manila. They then ‘visited’ several locations including spending a few days relaxing poolside at Villa Kasadya (see photograph). After their ‘holiday’ they were handed over to our Philippine partner Balay Mindanaw who will ensure they are delivered to a location in the region around Marawi. If you are traveling to the Philippines, or Bhutan, you may be able to help us be delivering a Skyhydrant. . . . . . but there is no need to take them to the pool! Are you interested in helping us? . . . . . Contact Jan at admin@disasteraidaustralia.org.au and she will see if we can find you a ‘travelling companion’. Although sponsoring a $5,000 SkyHydrant is expensive, that doesn’t mean that every donation is not greatly appreciated by Disaster Aid Australia. 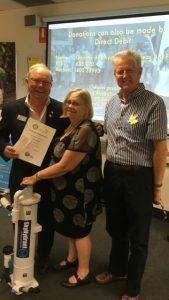 Here is Director John O’Reilly receiving a cheque for $1,000 with President Jan Cook and Chairman Nigel Cooper of the Rotary Club of Mont Albert and Surrey Hills. 1/5th of the cost of an Emergency Water Treatment Pump and Filter to keep 100’s healthy. 13 Sawyer Water Filters to provide a temporary safe water solution for 13 families. Travel and Accommodation for a Disaster Aid Response Team member to get to a disaster location. 4 Home Repair Kits typically including sheets of corrugated iron, timber and nails enabling people to rebuild their homes. 20 Tarpaulins for temporary shelter and building repair. 100 Hand Tools such as saws and hammers. Without your donations we simply would not be able to deliver aid.